This first photo is a daytime shot of the same scenes depicted below. I sat in the same chair so the elevations will be the same in all the photos. All of my photos were left normal full size so you can tell they are not doctored photos. 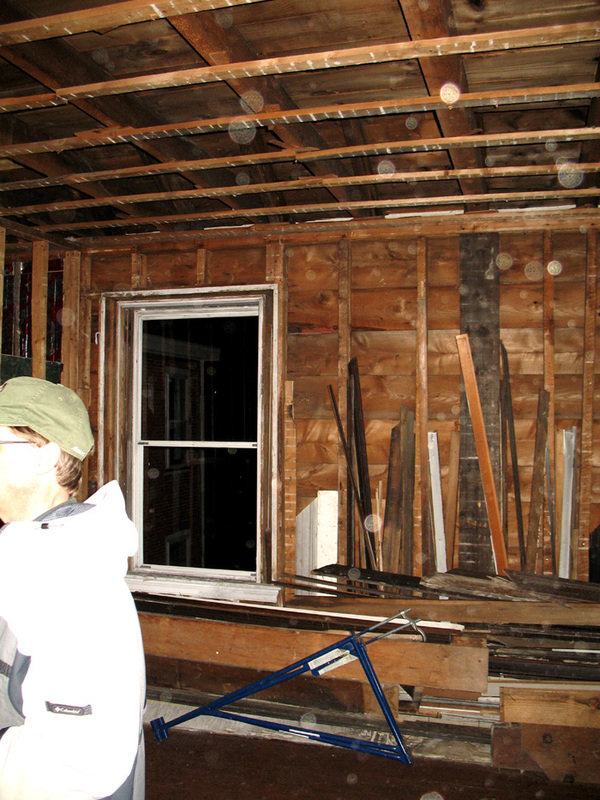 Over the last few years, we have seen orbs of light in many types of photos. 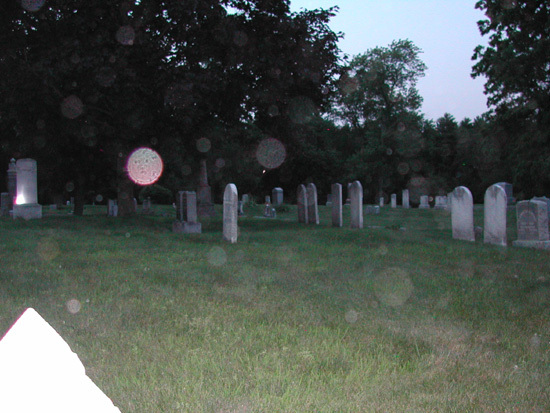 Some of these orbs were claimed to be angels, some were claimed to be UFOs, some were claimed to be spirits or ghosts. These orbs come in all sizes, shapes, and colors. We will show some examples of photos we took in our own front yard. The first photos were taken by myself, around 10 p.m. three nights in a row. This first photo was taken on 8-7-06. There are two white squares in the photo. The large one is the reflection off of a sign attached to the telephone pole. The smaller one we didn't identify immediately. I think perhaps it is the window of a house about 1/2 mile away. The pole showed up in the photo when I took the photo with night vision feature of the Kodak camera I was using for all three nights. The camera is a digital Kodak CX6445. The second photo was taken the same night - 8-7-06 - with the camera aimed about 10 degrees to the left of the first one. The reddish orb is off to the far right. You will have to scroll over to the right to see it. I took 5 photos on 8-7-06 - but there were orbs on only two photos. The others had none. 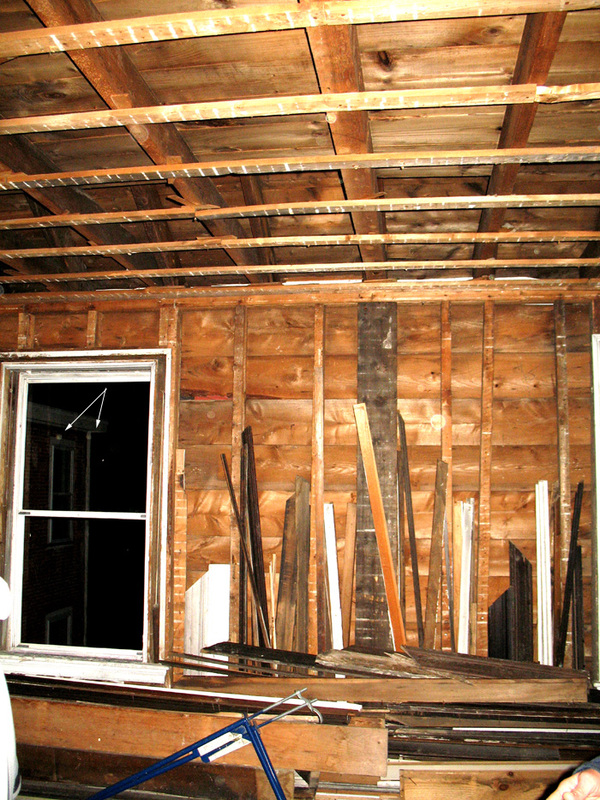 On 8-8-06, my experience was the same - not all the photos had orbs on them. The second night, I used night vision and held the camera in the exact same position, taking photos every 15 seconds as soon as the light turned green after shooting the previous photo. 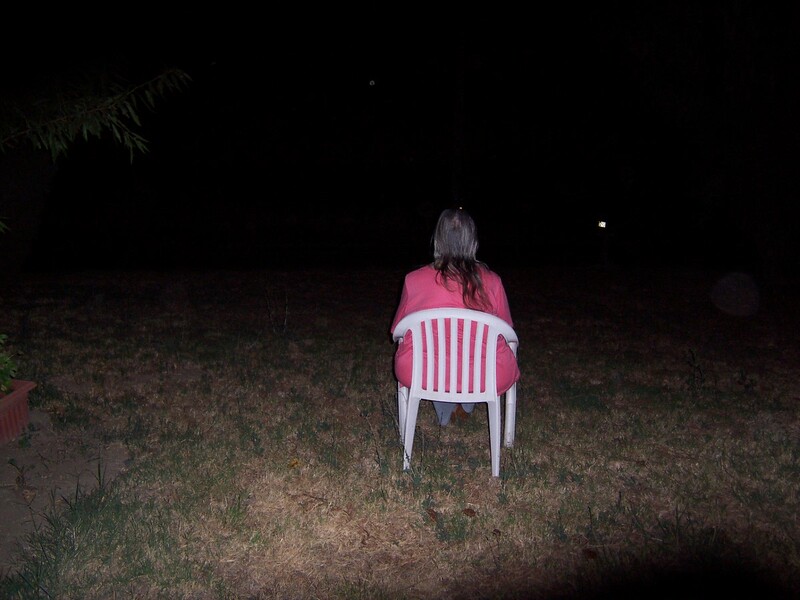 I did not meditate or think about dead people or ghosts whatsoever, I just went outside, sat down on a chair and commenced shooting the photos. At one point a car went by and I thought that immediately after its passing, I would see strange orbs in the photo from the dust thrown up by the car, but there was none. I had been told earlier the same day that orbs are created by dust particles in front of the camera. Obviously, there was no dust behind the car. If there was, the camera didn't make orbs out of it. On this night I had to take 7 photos before an orb showed up. I was pretty proud of this one. I didn't move the camera at all through the series of photos, I just sat on my chair and continued clicking the photos one after another. So, why did this red orb show up? I was really surprised to see it. I should say too, this was a full moon night, and I tried to hide behind a thick tree to take the photos. I wasn't aiming at the moon, which was about 40 degrees to my left. After I took the other photos, I had a heated discussion with a friend of mine who also takes photos like these, but in a cemetery. 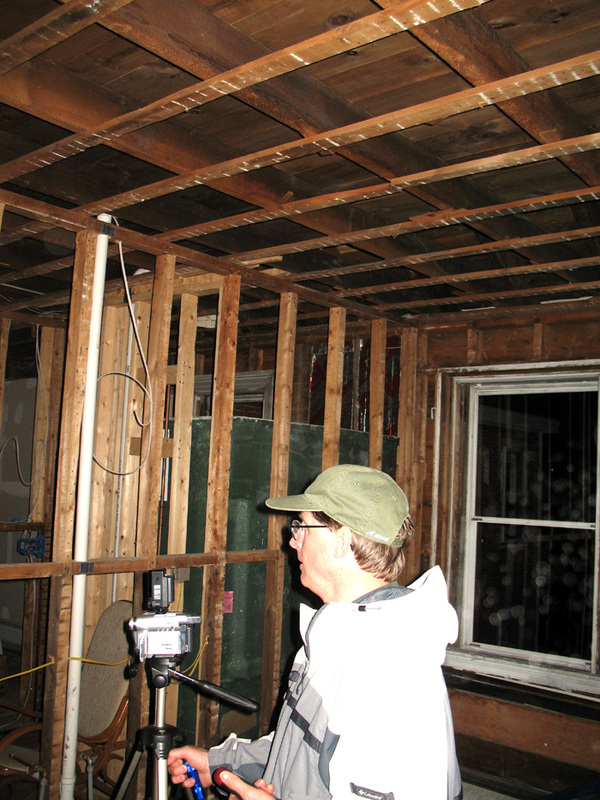 She had submitted the link to her website to the site of a prominent ghost hunter. He wrote back and told her that her orbs were dust in the air. You can just imagine how hurt she felt, especially since he used unkind generalities regarding people who had not taken his expensive course on ghost hunting. He shall remain nameless here. There were no orbs on the next photo following the red one, but in the next there is a greyish one near the ground off to the right on this - the 10th photo. Those were the only two photos that had orbs on them out of 17 photos. On 8-10-06 - we decided we would experiment with throwing dust into the air to see if it indeed created orbs. I took seven pictures first prior to tossing the dust into the air in front of the camera. We took a total of 15 photos. Some had orbs, some didn't. There were no orbs in the first photo. 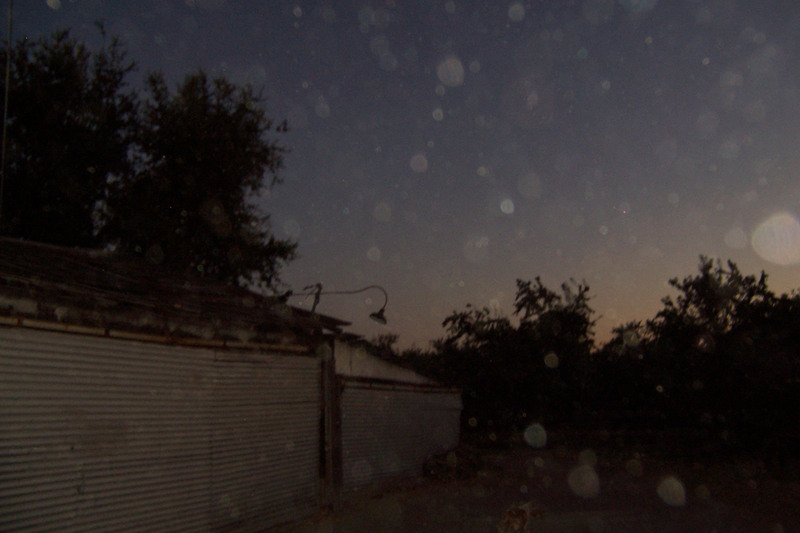 According to the experiment the dust tossed into the air away from the camera didn't create orbs, but you will be surprised what it looks like when the dust tossed into the air is right up against the camera. First are my own photos. After we came back into the house to look at the photos, Joe went back out by himself and tossed the dust right at the camera. A lot of it. This would not be a normal circumstance at all. If the dust in the air was this thick, you couldn't breathe it yourself. It was that thick. Photo one had no orbs. Photo two had one. Its low down to the right. Photo three and four and five had no orbs and Joe tossed the dust into the air after the photo flashed while we were trying to figure out exactly when he should toss the dust. This is photo six. It has an orb high up right below the typing. Photo seven and eight had no orbs. This is photo nine. The dust is over to the right. Photo 10. You can see fading dust because the dust was tossed before the camera shutter went off. Photo eleven. This was a good effort at getting the dust in front of the camera. There are reflecting specks, but no orbs. The bright spots off to the right are the same ones from previous picture - reflected metal on the road sign and telephone post across the street. Photo twelve. Here again, you can see the streak of dust - no orbs. Photo thirteen. This photo was taken immediately after the other one as soon as the green light came back on. Note, there are no orbs and the dust had already settled. Only about 30 seconds or less had elapsed. Photo fourteen. Joe decided to move over about 40 degrees behind me so there was a dark background of trees. I just turned around on the chair and snapped this photo of him. I actually couldn't even see him in the dark. Note: if you look closely at the photo, there is an orb between the camera and Joe that is by his back. There is a larger one in front of him and another one behind him. Several smaller ones are above him. Photo fifteen - Joe decided to mess with me. I couldn't see him in the dark at all. He must have chased all the orbs away with his antics - there were none in the final three photos after this one either. Joe is about 25 feet away from the camera in both photos. Just as a point of reference, two years ago, there was a dead body found in a dry canal on the edge of our property. This area was also the hunting grounds of a tribe of Indians, but we have not investigated exactly where they lived. 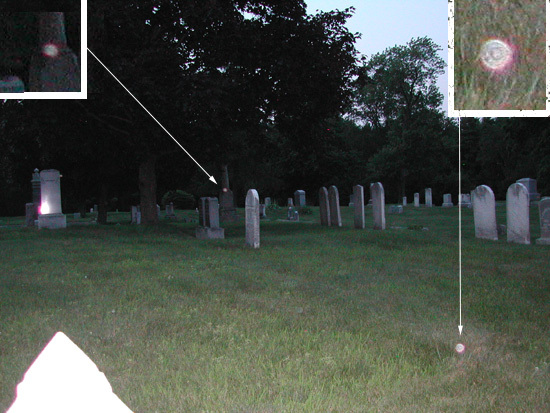 On August 12, 2006, we decided we would try to get some orbs in a photo of myself in it, just to see if people attracted the orbs. It might have been a bad night to do this, because there was a power outage in the neighborhood, which was brief, but the local electrical trucks came out to work on the power line, and were still parked about 150 yards east of our house at 10 p.m. We waited for the truck to leave, but even so, that disturbance might have had an effect on what we were trying to do. Joe took two series of photos, with the chair in a different spot in the second series. The second series produced nothing - no orbs at all. The first series had 5 photos in it, and only the 4th photo produced orbs. There are two in this photo - which I can see only with the lights off in the room because the screen has too much reflection with the room lights on. In this photo, there is a bright light right on top of my head, but that is the reflection from the telephone pole. There is one small orb near the top of the photo, and one large one to my right way over at the edge of the picture. Its quite faint so you might have to get close to the picture to see it. Moraga in 1806. The word Stanislaus is derived from Estanislao, the baptismal name of a mission-educated renegade Indian chief who led a band of Indians in a series of battles against Mexican troops. After he was defeated by General Mariano G. Vallejo in 1826 the river was renamed Rio Estanislao for the Indian chief. The word "Stanislaus" traces back to a mission-educated Indian chief baptized "Estanislao," after a Polish saint. Estanislao ran away and after he was defeated by General Mariano G. Vallejo in 1826 the river was renamed Rio Estanislao for the Indian chief. . The county took its name from the river. The Diablo Range rises along the west edge of the county, and the Sierra foothills border on the east. Three major rivers course through the county: the Stanislaus, the Tuolumne and the San Joaquin. The rivers and the state's largest groundwater basin irrigate bountiful floodplain farmlands. After we looked at the above photos, Joe went back outside to experiment with tossing the dust and taking the photos all by himself. These are his results. The first two test photos, in the same directions as the above photos had no orbs in them at all. Here is the first photo where Joe dropped the dust in front of the camera about a foot in front of the lens. Joe dropped the dust about three inches in front of the camera for this photo. The dust was dropped about two inches in front of the camera for this one. This last photo, the dust was dropped within an inch of the camera. So, its pretty obvious that the dust has to be practically on the lens of the camera to show orbs of light from the camera flash. One has to admit that dust creates orbs of light, but in photos of other people, the cameras are many feet away from the orbs, they are not close to the camera at all. On 8-15-06 - Joe and I went outside and took 5 10 second videos, and 5 photographs and when we uploaded them to the computer, all the videos were pitch black - there was nothing seen - not even ambient light - the photographs just showed myself but no orbs. Joe deleted the photos from the camera and I went back outside and took another series of photos - this time 27 photos. I kept thinking I was seeing a house light on the camera, so I shifted the camera each time I took a picture. 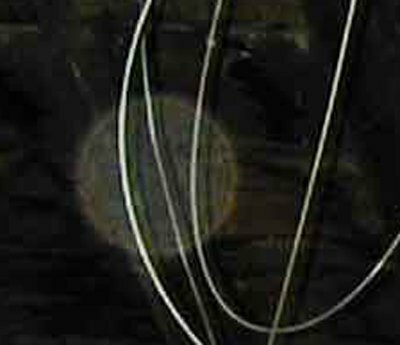 Six of the photos, each one taken in a different direction had orbs in them, ranging in color from grey to silver to reddish. One of them is the coup de grace - PROOF that not all orbs are dust no matter what other researchers might say. 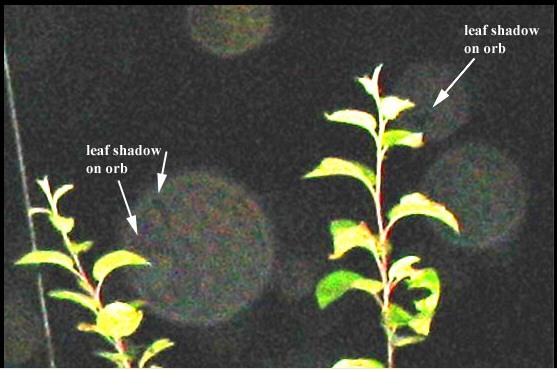 This photo is of an orb that is in front of a large tree, but behind the branch of a tree closer to the camera. The orb itself, from this position had to be at least 25 feet from the camera. In 2008 - Joe went outside to snap a picture of one of our kitten which was laying up on the garage roof. He didn't try to catch orbs - didn't even think about that, but look what he got. Scroll to the right to see all the orbs. This is an amazing photo. We think these are all Indian spirits - probably those who were massacred many years ago in this area. We are just guessing but it makes the most sense to us. 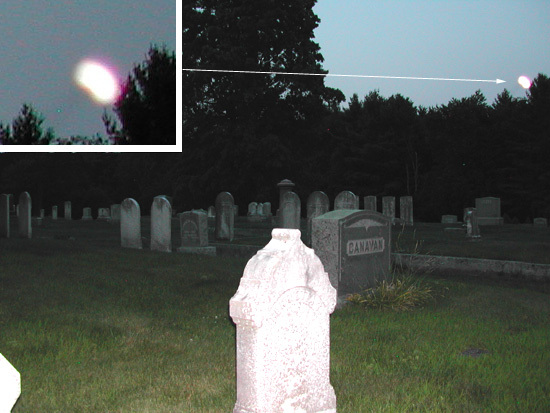 Here are some examples: This is a daytime photo in a cemetery in New Hampshire. The researchers who took these photos take many, many photos. They use not only a digital camera, but a 35mm camera at the same time. Some photos have orbs, some not, even when the photos are taken right after another like I did. These researchers take photos of the same scene at the same time for corroboration and keep careful records of each nights photographs. 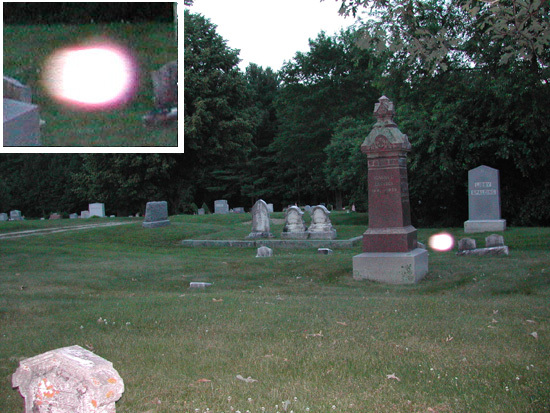 In many cases, one camera will capture orbs and not the other. Other times the second camera gets the orb photos and not the first. Excellent example of orbs behind objects that are NOT dust. This next photo was taken only a few seconds after. I just turned my head and took another photo towards the energy, because I felt the energy coming. Look closely at the window.. look at all the orbs there now. 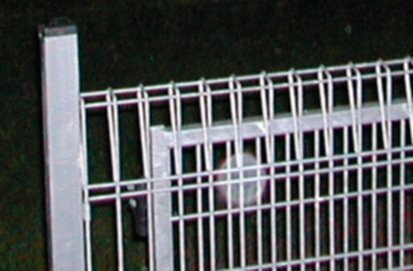 Here are a couple of photos of orbs that are clearly behind solid objects - not near the camera. These photos were posted on line by other people who were studying the same phenomena. The following link is of a family who lives near us.